Vision is a Marvel hero. He is a highly advanced android who was created by the robot Ultron to destroy the Avengers. While others find their relationship bizarre the Vision and the Scarlet Witch have been lovers for much of their comic history. 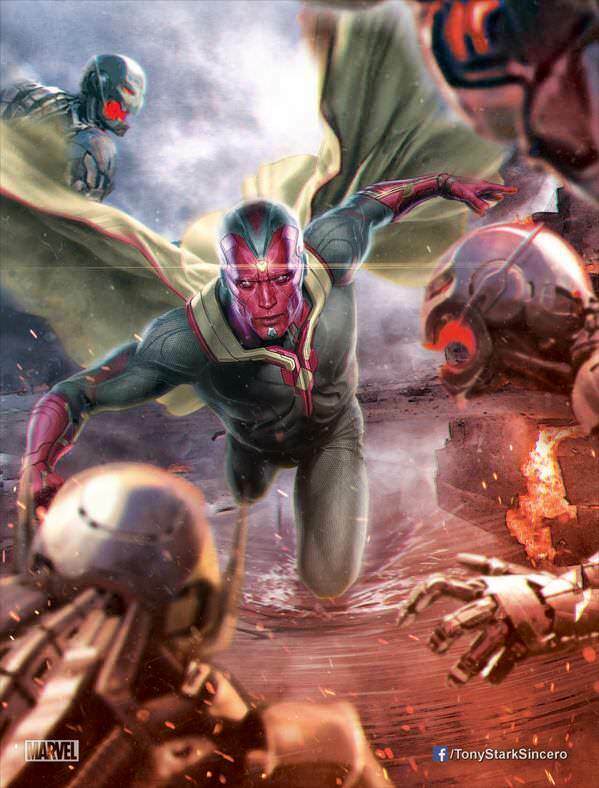 The Vision will appear in the movie Avengers: Age of Ultron. He will be played by actor Paul Bettany who has previously been the voice of the Iron Man A.I. Jarvis. What does it mean to be a man? Where does life begin? These are the questions you are asked when you contemplate the Vision. Ultron creates the Vision to destroy his own creator Hank Pym. Creating Vision for Ultron is also meant to show that Ultron too is capable of the act of creation. While Vision is very powerful, he is also more human than Ultron and the Avengers are able to convince him that they are not the enemy. Together they are able to bring down Ultron. Ultron used the mental matrix of the comatose Wonder Man to make the Vision even more human. 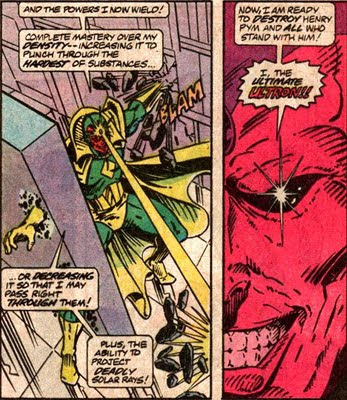 The Vision becomes a regular member and sometimes leader of the Avengers. Much of the character's life is spent with the goal of becoming more human. He is very similar to Data on Star Trek: The Next Generation exploring humanity in an attempt to make himself more human. He begins to have a romantic relationship with the Scarlet Witch. To the chagrin of the other members of the Avengers the relationship grows more serious. Eventually the two are married and even have children. The children are basically magical constructs made by the Scarlet Witch (Later it is revealed they were also derived from portions of the demon Mephisto's soul). Tragedy strikes the Vision when the US Government abducts and dismantles the him. Hank Pym is able to put the Vision back together piece by piece but the Vision is altered. He is no longer a synthetic man but more of robot. He no longer has skin and is chalk white in color. Wonder Man also refuses to allow his mind to be used as a mental matrix for the reconstructed Vision. To add to the tragedy the children of Vision and Scarlet Witch are reabsorbed into the Demon Mephisto and effectively disappear/die. The stress of losing her husband and children cause the Scarlet Witch to go temporarily insane. When the Scarlet Witch recovers she operates on a separate Avengers team as the Vision. The Vision slowly regains his humanity but he and the Scarlet Witch never entirely get back together. 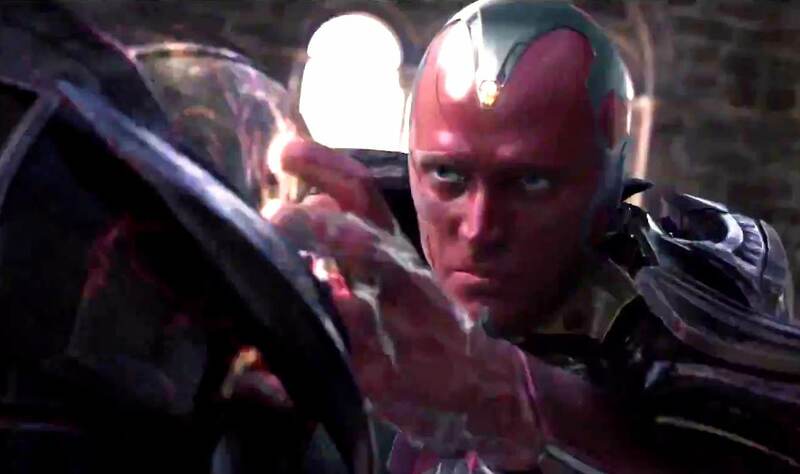 Later Ultron manages to take control of the Vision causing spheres to emerge from his body that attack the Avengers. She Hulk ends up destroying the Vision in a rage. Finally, Tony Stark manages to recreate the Vision, who forgives She Hulk for destroying him. He is unable to reconcile with Wanda but he does strike a friendship with the hero Wiccan who is actually the reincarnated soul of one his children. Ultron creates Vision from the body of an old android that fought along Captain America in WW2 in the group called the Invaders. This android was called the Human Torch (Note: This is a completely different Torch than the one in the Fantastic 4). Ultron also uses the mind patterns of Wonderman. For this reason Vision shares many behaviors and values of Wonderman. Wonderman had a crush on Scarlet Witch, and so Vision too would be in love with the Scarlet Witch. Some of this creation was later revealed to have been manipulated by a powerful, time traveler Immortus. Immortus feared the reality warping powers of the Scarlet Witch and sought to give her a mate whom she could not have children with. In this way her powers would not live on when she died. Density changing, can phase and become intangible or extremely tough. 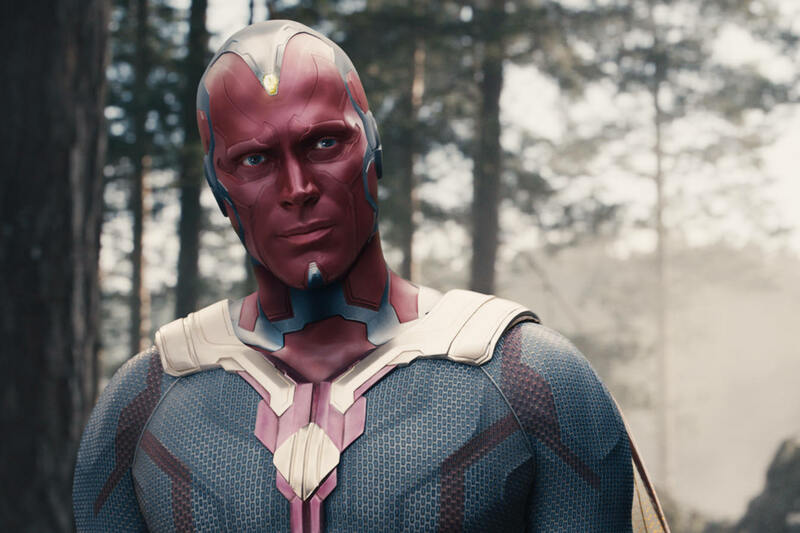 Vision makes his first appearance in Avengers Age of Ultron and is played by actor Paul Bettany. Paul Bettany initially played the voice of Jarvis. 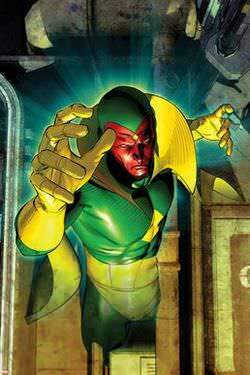 Vision also appears in Captain America 3: Civil War. He is expected to appear in Avengers Infinity War 3 and 4 as well. Paul Bettany took part in a Q&A at AsiaPop Comic-Con where he made the following comments about reprising his role as the Vision in Captain America: Civil War. "It was a lot of work!" ... "We all had a bit more fun. You know, there were more improvised jokes between me and [Robert] Downey Jr., and me and Chris Evans, and it was a really loose atmosphere on-set. It was one really loose set, it was great!" ..., "I would totally lie to you if it wasn’t, but I don’t have to lie. And we all get on. They’re all a really nice bunch of boys and girls. They’re all happy to be there. They’re being terribly well-paid, so they should be happy to be there. And work’s really creative and fun, you know? I got to be born on camera, you know, that’s unlikely to ever happen again." "I was given comics," ... "I also was looking to think about what could be edifying for me to learn. I took the opportunity—you see my character get born… something unlikely to ever happen to me again. He must be both omnipotent and yet totally naive at the same time. And experiencing the world in real time and his place in it. Is he going to be a force of good or a force of evil? It was really interesting, fun to play with, because he is dangerous, you do not know if he’s going to go one way or another. And I’m continuing that theme in Captain America 3."